Antonio Bencivenni, who was born in Mercatello in the Duchy of Urbino, was a woodworker specialising in intarsia. He seems to have been based in Perugia from 1498 until ca. 1518, when he moved to Todi. He died there ten years later. The inscription in the second panel from the right records that Antonio Bencivenni executed the work in 1501 for the prior, Brother Severus of Cesena. The middle panel is now missing: given that the panels to the sides of it depict instruments of the Passion, it probably contained a scene of the Crucifixion or the Pietà. four coats of arms are depicted, belonging to: Bishop Giulio Vitelli; the Brozzi and Bufalini families; and the Servite Order. 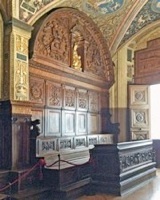 Crispolto di Polto da Bettona and his assistants began work on the choir of San Domenico in 1476. Antonio Bencivenni was charged with the completion of the project in 1498. The stalls were restored in 1911. Antonio Bencivenni signed the wooden imposts on the interior side of the door of the Sala dell’ Udienza (Audience Chamber) of the Collegio del Cambio in 1501 and was paid for the work in the following year. The Lombard Gasperino di Pietro was commissioned to renovate the adjacent church of San Giovanni del Mercato and to adapt it for use as a chapel. He was paid for this work in 1509. Its main door (1508) is attributed to Antonio Bencivenni, who had signed the corresponding door into the Sala dell’ Udienza seven years before (see above). 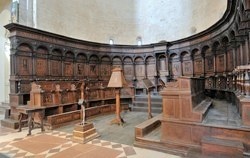 Antonio Benicivenni was certainly at work at this time on the wooden seats for the chapel (some of which are illustrated above), which are dated by inscription to 1509. Those to the left included this representation of the arms of the college. In 1516, Antonio Benicivenni was commissioned to paint the frame for the altarpiece of the chapel. 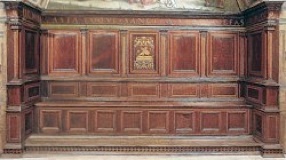 The carving of the choir stalls is particularly fine. Antonio was already old and in poor health when the commission was made, and he seems to have had a subordinate role to his son, Sebastiano Bencivenni. He died in 1528, before the work was complete. Return to Art in: Città di Castello Perugia Todi. Return to “Foreign” Sculptors in Umbria.